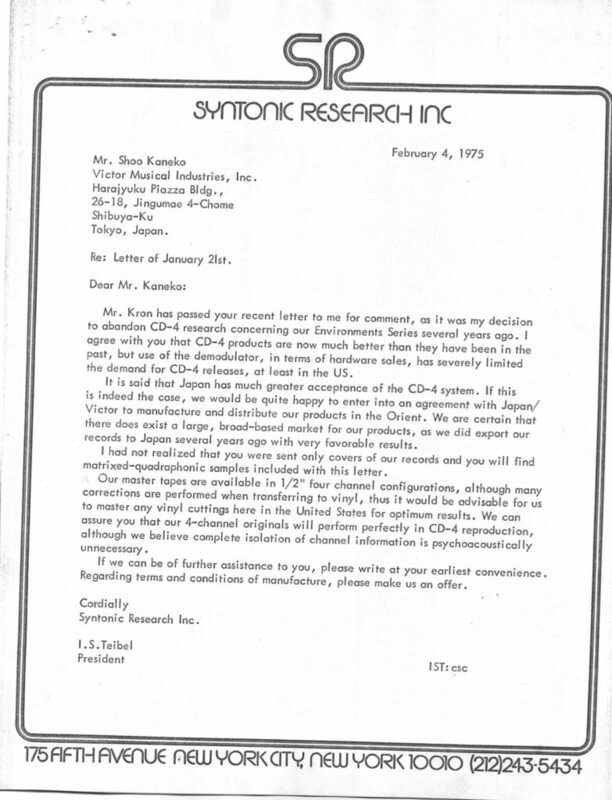 As a quadraphonic enthusiast, collector and somewhat of a historian, I didn’t know what to expect when I reached out to Syntonic Research. 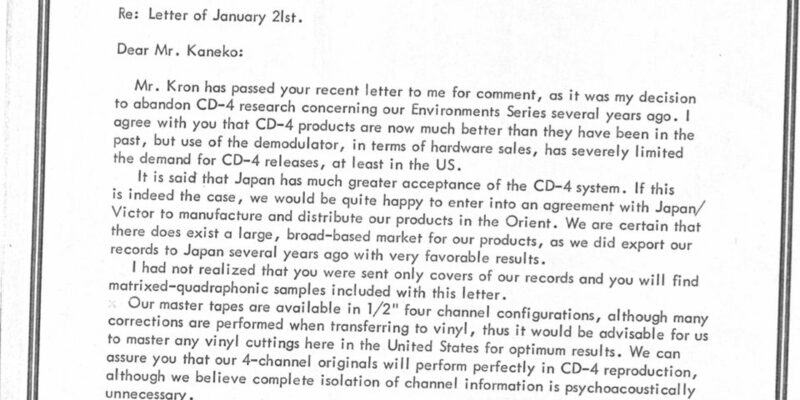 I wanted to get information about the hardware and processes used to make the quadraphonic mixes on the Environments series and The Erickson Tapes. To my surprise, I promptly received replies from Jennifer, Irv Teibel’s daughter. Her kind, detail oriented replies left me with the impression that she runs the company exactly as Irv Teibel did. This is not the sort of company that claims to value its customers like so many do without following up with action. Syntonic Research is a company about of and building actual relations with its customers. Quadraphonic was a great idea brought forth in the early 70s. It expands the two speakers of stereo to 4. This allowed for higher fidelity, further creative possibilities in mixing and the ability to recreate environments (usually the recreation of the sound of the venue a concert was played in). For the most part, Quadraphonic and Surround audio declined in popularity due to the number of systems employed. These systems were backed by the various record labels and electronics manufacturers. There were two dominant Matrix systems for vinyl and radio along with a more discrete (and difficult to use) system called CD-4. Matrixed quadraphonic means that it encoded the quad signal into the stereo signal. This delivered the 4 channels of sound through the two stereo channels. Some examples of 70s matrix formats are DY, EV-4, SQ and QS/RM. There were also the discrete tape formats on Reel To Reel and 8-Track. Environments 4-11 are all marked quadraphonic. All copies of each of those albums have definitely been encoded for quadraphonic playback. They are advertised to work well with SQ and QS/RM. That claim is very true, with just about any quad decoder, the records give you an impressive feeling of actually being there. Being surrounded by the environment, not just listening to speakers. A natural sounding environment, not just a 4-corner mix with no thought. The Environments series in my opinion has to be one of the most realistic and natural uses of quadraphonic sound. When you listen to “The Wood-Masted Sailboat,” you are not just listening to a recording of a sailboat; as far as your ears are concerned, you are on a sailboat. An effect that sometimes provided me with slight tinges of seasickness. While there still is some uncertainty to the specific processes Teibel employed, he was correct that you did not need a specific matrix decoding system to enjoy the records. Absolute pinpoint accuracy in directionality is not necessary as it is an environmental recording. Most quadraphonic matrix decoders will get you close enough to enjoy the experience. Most Quadraphonic enthusiasts believe he was using the DY matrix or something similar. That is quite possible but not 100% verified as of yet. There is documentation that Irv even used quad processes on the 1969 release “The Psychologically Ultimate Seashore.” This makes him an early pioneer of quadraphonic sound. His use of quad didn’t end with the Environments series. 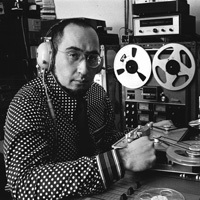 He also encoded Raymond Erickson’s album The Erickson Tapes in quadraphonic. The Erickson Tapes included earlier synthesizer performances mixed in a fun way where the notes ping-pong around you, each originating from a different direction. Any update on re-mixing the other Environments albums for digital? Hi Bruce! Thanks for writing. The environments Albums are available digitally on Spotify and are currently being remastered. Hope that helps! I’m not a 5.1 guy – so I’m biased – but – why would you want recordings mastered as 4 track released as 5.1?